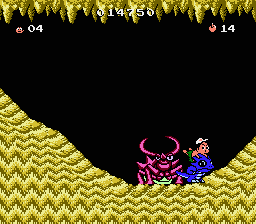 NES Hudson's Adventure Island III (USA) in 25:10.38 by Sami. The Adventure Island game series is known for its extreme straightforwardness. Regardless, the games are pretty fast-paced so if you have some free time on your hands, shut down your brain and watch this carefree TAS. In this new version, Sami found what was left to optimize and improved Phil's previous movie by 17 seconds.